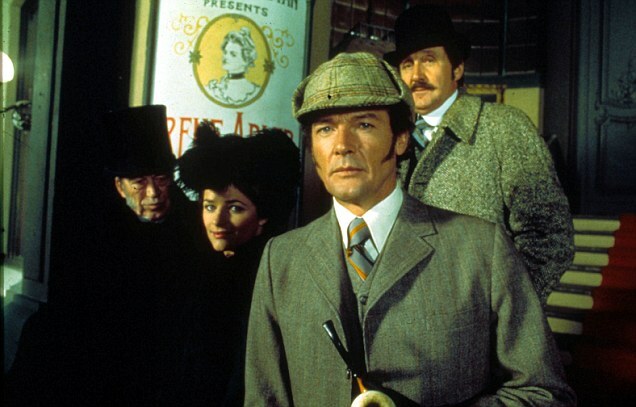 The opens with Sherlock (Roger Moore) confronting Professor Moriarty (John Huston) and telling him that he has just broken up his organization. Moriarty tells Sherlock that he will get even with him. Sherlock and Mr. Watson later get torn up theater tickets in the mail and Irene Adler in starring in the New York play. She always sends Sherlock opening night tickets. What did Moriarty have to do with this? Sherlock knows he is going for his one weakness. Sherlock and Watson meet Irene (Charlotte Rampling). Her son has been kidnapped. Sherlock is told to not help the police when they approach him on a new case or the boy will die. The police then approach Sherlock a room full of gold that has been stolen but Sherlock has to refuse to help them. Sherlock rescues Irene's son and then helps the police with their case. At the end, after Sherlock's triumph, Irene hints at Sherlock being the father of her child and then gives him a picture of him. Not bad, but the production values for this TV movie was only fair, and with Roger moore, John Huston and Charlotte Rampling it should have been much better.